This Irish blessing plaque features Celtic knots and it is suitable for outdoor use. This Irish blessing plaque features the following verse: Live now the dust will settle later. 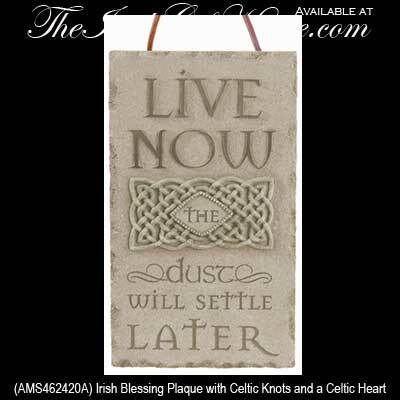 This Irish blessing plaque suggests that you should live now and it is enhanced with Celtic knot-work. The Celtic blessing plaque is made of a cement and resin combination that is suitable for garden decor; the dimensional design measures 4" wide x 7" tall. The Irish blessing is ready to hang on your wall with the included cord and it is gift boxed with a Celtic knot history card, complements of The Irish Gift House.